I’ve been all about finding ways to add pops of color this spring, mixing prints and encouraging you to go out of your fashion comfort zone. But sometimes a great neutral outfit is necessary and just down right perfect. That’s what I would call this outfit today – downright perfect. It features neutrals and I show you how I styled it with two different pairs of incredible shoes. You see those amazing shoes up there? Yeah, the ones I’m smiling about. I’m slightly obsessed with them, as well as finding new outfits to wear them with. I’ve worn them with a coral dress and they look fantastic. I’ve worn with them a romper and loved it. So, I thought I would try them with shorts and sure enough – perfect. The Kiki by X-Appeal Wedges are fun, versatile and will definitely see a lot of outfit action this spring and summer. You can purchase them at your local Rack Room Shoes. 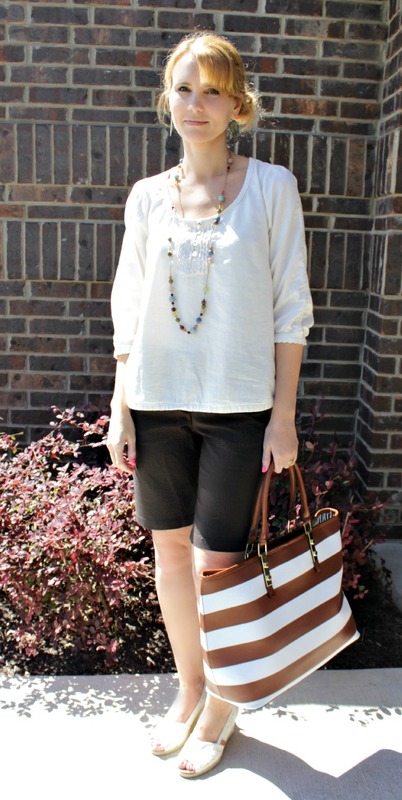 I also paired my neutral outfit with a pair of Madden Girl Crochet Wedges also from Rack Room Shoes. Another very versatile pair of shoes! I’ve worn these with several different outfits, including a pink Rue 21 dress. One outfit – two different pairs of shoes. My only problem will be deciding which pair to wear! Which pair is your favorite: the Kiki Wedges of the Crochet Wedges? For more shoe goodness – you can find Rack Room Shoes on their social media channels. Stop by and say hi! I linked up with Very Busy Mama for #RealMomStyle. Be sure to visit for some super fabulous style posts from other mommas. Disclosure: MomFabulous received samples to facilitate this post. Next articleFashion for Good: Bené Launches May 1st + A Coupon Code for You! 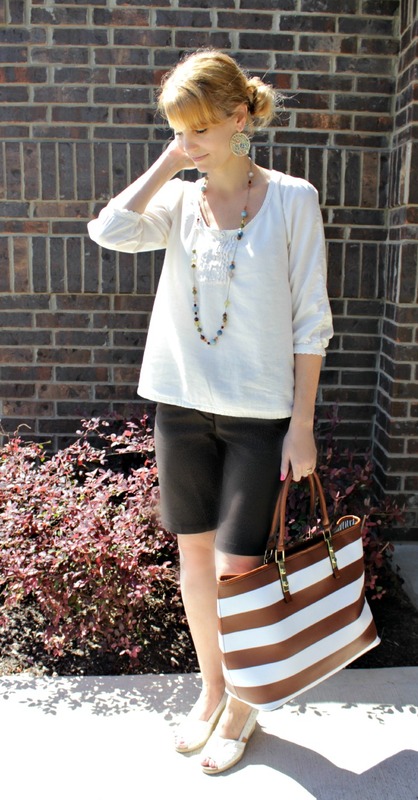 I love wedges with bermuda shorts so classic, both of those are really cute! Thank you Ellen! I haven’t worn these style of shorts in quite some time and I think I’m hooked! Very pretty, I saw this on Instagram and thought I like both ways. Love the shorts. Thank you Andrea! I’m loving all these fun wedge styles this spring. (And the shorts! 🙂 ) Your vest for #RealMomStyle was perfect! I don’t wear shorts, but I’d wear those! Very chic and smart and classic all at once. Thank you for linking to #RealMomStyle and you’ve been pinned to our board! Thank you Maria! I’m attempting to wear more shorts this summer and I love these. They seem to cover in all the right places. 🙂 Thank you for pinnning me to your board! I’m heading over there right now…. You look flawless. This is such a great outfit for you!! Thank you so much Nicole! I definitely think it’s one of my favorites now. I like the cream wedges, mostly because they seem like they would be easier on the feet when carrying kids lol!